The Weredeer Liberation Front announced the start of “hunting season” in Will County. The statement goes to condemn Will County Forest Preserve efforts to “cull” the deer population. Jill Beckham, an expert on the local weredeer population, says that the WLF is a radical terrorist group, and do not represent the average weredeer. She explains that the group split over a disagreement about mating with humans verses deer. Ten years ago, the Bolingbrook Jaycees persuaded Will County’s weredeer to pursue “traditional” relationships with humans or just mate with deer. Carl, a Romeoville resident, who asked that we not use his last name, survived a weredeer attack. 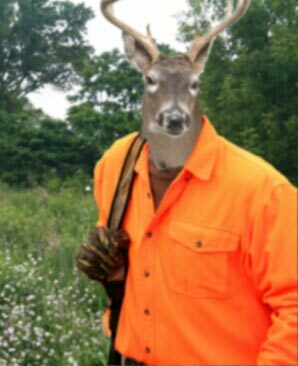 Officer Joe Reed of Bolingbrook’s Paranormal Affairs Division, says the village is ready to deal with any Weredeer hunters. Source: Aliens are on the 16th floor of FermiLab! Haha, good one. The picture makes much more sense after reading the article. I didn't get the picture before but when I read the article I understood it. This blog is so funny. I found this blog to be weird and funny as well. Where do you get the content of this? Great post. Did I get that right? They have to mate with either a human or deer? Oh my God I will have to check that out with a list of ron receveur scams to see if that is just something meant otherwise. Eitherway, it's quite hysterical.